This newly refurbished family friendly gastro pub now has an artisan fish and chip shop and 12 new double ensuite letting rooms with wi-fi, high definition TVs and tea and coffee making facilities. 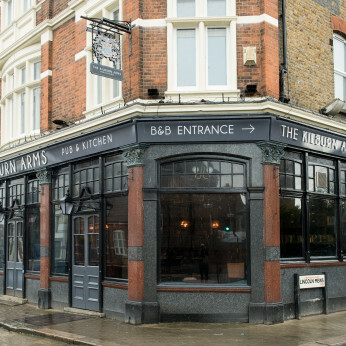 A large new kitchen has been installed allowing the Kilburn Arms to offer food for the first time with an area partitioned off to cater for the fish & chip takeaway service. The whole interior of the pub has been redecorated and upgraded with new fixtures and fittings and a disabled toilet. A mix of banquette and freestanding seating has increased the covers by 20 to 93. The look of the dining and lounge area is traditional English inn with panelling, parquet floor, gaslight effect lighting and classic William & Morris style wallpaper. The drinking part of the pub is reminiscent of a gentleman’s club with button back leather arm chairs, pendant lighting and upholstery in earthy tones. A copper mesh ceiling provides interest and adds to the warmth of the room. We're really sorry but we don’t seem to have any offers or events for Kilburn Arms. We're sure there must be something happening here but they just haven't told us about it! Please do mention this to Kilburn Arms when you next visit them.